By now, we hope you are all aware that Baconfest Chicago 2015 will happen on April 17-18 at the UIC Forum featuring over 170 chefs from Chicago’s unrivaled restaurant scene. All are gathering to showcase their bacon-prowess in support of our long-time charity partner: The Greater Chicago Food Depository. As of this writing, there are still some tickets available for the Friday and Saturday Dinner Sessions, but they are evaporating as I type. Visit our Eventbrite ticketing page: http://baconfestchicago2015.eventbrite.com to get yours! Meanwhile, over the next 5 weeks, we will be unveiling a series of contests to win some free tickets: The first in this series is The Nueske’s Amateur Bacon Cook-off. For the seventh consecutive year, we’d like to welcome a MAJOR sponsor aboard: Nueske’s Applewood Smoked Meats. Their bacon is great. We love them. Visit their website, order on-line and buy Nueske’s Applewood Smoked Meats at any of the fine retail locations in Chicagoland listed below. They donate THOUSANDS of pounds of bacon to our exhibiting chefs every year, and quite frankly, make Baconfest Chicago even possible. 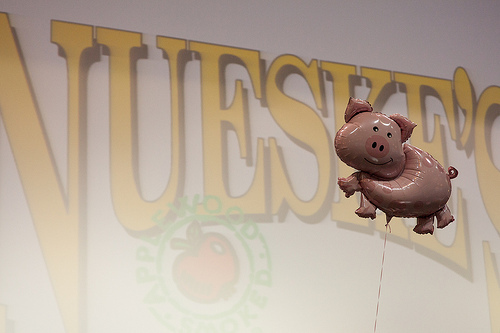 We can never say enough great things about Nueske’s, both the people and the Bacon! The Nueske’s Amateur Cook-off is inspired by their belief that the greatest bacon delights often come from the Everyman and so we are proud to announce…..
A description of the dish you’d like to present, including an ingredient list. YOU MUST SUBMIT A PHOTO of said bacon dish. We at Baconfest Chicago will select a set of semi-finalists and publish the entries for our social media followers to vote for their favorite dishes. The top 5 vote getters will be the 5 Finalists – plain and simple. Attend Baconfest on Friday April 17th as guests of Nueske’s and Baconfest Chicago. (You will be given a “contestant’s pass” AND two free tickets to bring along some friends). Arrive at 6:30pm for contestant orientation and you will be escorted to a private backstage room for prep. Bring 5 or more tasting portions of your dish to be served to a panel of selected judges. Part of winning this challenge involves making the most out of limited resources. You are welcome to bring any equipment you may need with you (please run large, plug-in, or fuel powered devices past us first). In the prep area you will NOT be given facilities to cook your dish on site from scratch. We will have a microwave on site for heating, and you will be given time to set presentation prior to serving. Take this into account when planning your recipe! We will provide plates/flatware for serving. Other than that, let your imaginations run wild. Beverage pairings are acceptable. And in case this needs clarification: Your dish must showcase bacon. No Canadian Bacon and NO Turkey Bacon allowed. And don’t even mention tofacon.